The "Talon" is a unique variant of the popular RFP-9 pistol. Its three-round-burst fire mode gives it incredible stopping power, and makes it one of the deadliest sidearms in San Paro. The "Talon" includes the Pistol Silencer modification, which both reduces muzzle flash and audio while removing bullet tracers. 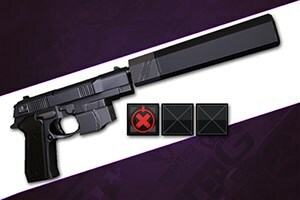 * There is currently a minor issue where the recoil effects of the Pistol Silencer are currently inactive. This will be fixed in an upcoming patch.